If your knee is damaged in only one compartment you may be a candidate for unicompartmental knee replacement. Your surgeon only replaces the damaged compartment with metal or plastic components. What is a unicompartmental knee replacement? If your knee is damaged in only one compartment you may be a candidate for unicompartmental knee replacement. Your surgeon only replace the damaged compartment with metal or plastic components. What happens during unicompartmental knee replacement? 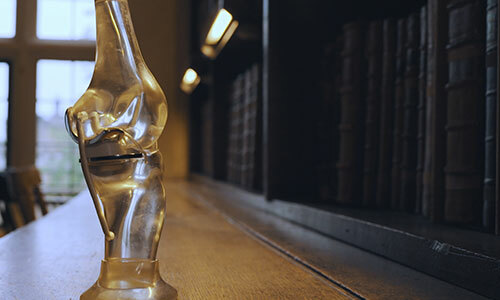 Unicompartmental knee replacement surgery usually takes between one and a half to two hours. The operation can be performed under general anaesthetic or spinal anaesthetic with sedation. Be sure and discuss your anaesthesia with the Anaesthetist before your surgery. Because unicompartmental knee replacement is less invasive than total knee replacement patients usually go home sooner and return to normal activities earlier. You may stay in hospital one to three days. Before discharge you will have an X-ray of your new knee to check its position. This treatment qualifies for Nuffield Health Recovery Plus Programme - this is free-of-charge optional enhanced recovery programme that enables you to continue your rehabilitation at a Nuffield Health Gym, with the help of a qualified physiotherapist.